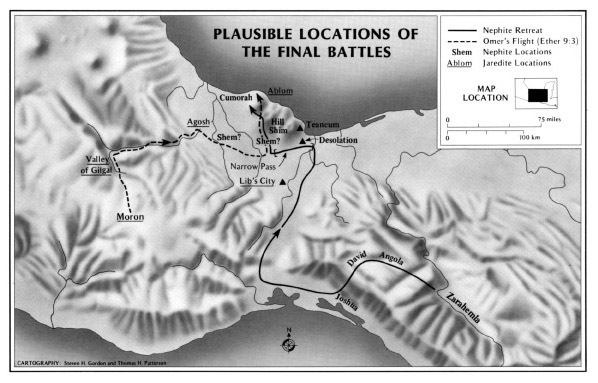 Though evidence from the Book of Mormon is not conclusive, final battles of the Nephites and the Jaredites probably took place not far north of the narrow neck of land. As shown, the Nephites marched from Angola, through David, and eventually came to the city of Joshua (see Mormon 2:4–6). Nephite defense lines lay in Joshua for fourteen years; finally they collapsed, and Nephites retreated across the narrow neck of land, fleeing to various sites (see Mormon 2:16). The hill Ramah/Cumorah, upon which both the Jaredites and Nephites fought their last battles (see Ether 15:11; Mormon 6:4–6), is shown here on the northwestern edge of the Tuxtla Mountains in Mexico, about ninety miles from a narrow pass (see Mormon 3:5). Other Jaredite locations, including Omer's flight to Ramah (see Ether 9:3), are also shown here. Again, these locations are plausible, but not definite.